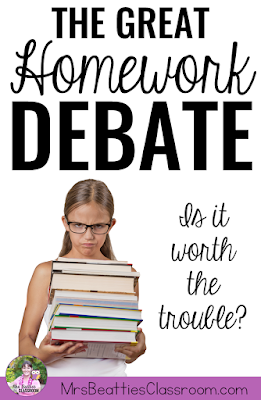 The Great Homework Debate - Is It Worth It? Homework - to assign it or not. Is it useful? Does it actually benefit students? The debate rages on and most people I know don't really have the answers. I've decided to share my two cents on the matter (round it up to 5 cents in Canada! ), but please know in advance that these are simply my personal thoughts, based on 18 years in the classroom, not research findings. Homework provides teachers with a platform for spiral review of class work. Assigning a handful of questions from a content area each night requires students to apply the skills they are learning in the classroom to new problems or contexts. Regular review, if done right, can allow a teacher to move forward more quickly in the classroom without having to spend class time reviewing concepts. Homework gives parents the opportunity to stay connected with what is happening in the classroom. Parents get to see firsthand what their child is working on, which gives them the opportunity to help enrich this learning in the real world. For example, what better way to apply an understanding of fractions or measurement than by breaking out a favorite family recipe book? Homework teaches our students about time management, how to organize their resources and how to prioritize their after-school activities. There are always things they are going to want to do more than homework, but this is also an important life lesson - sometimes we just need to sit down and complete the "must-do" activities before we get to the "want-to-do" activities. First and foremost, I can't evaluate homework as part of my student assessment. Sorry, you can't argue me out of this one. When work is sent home I have NO control over how much support a student has received (or not received!) and this absolutely cannot be evaluated. To do so would be completely penalizing my students who have no parental support at home. Homework practice can be detrimental if your students are practicing the skills INCORRECTLY!! If your students can't figure out how to multiply, what is the value in giving them 20 questions to complete at home? All they are doing is practicing the wrong way... oops! The older students get, parents are less able to help with homework. I hear this all the time in the staff room... "Thank goodness my husband knows math... I can't help Billy with his homework anymore!" or "I had to completely reteach myself how to do ____ to help Sarah with her homework!" How frustrating is that for everyone involved?! Probably my BIGGEST frustration is that no matter what I do, there are always several families who just don't buy in. For me, it makes the time and energy I put into preparing the homework activities feel like a huge waste. Why spend my planning time or after-school time preparing, organizing and copying homework activities that are never going to be looked at?! Finally, I am a firm believer that kids need time to be kids. 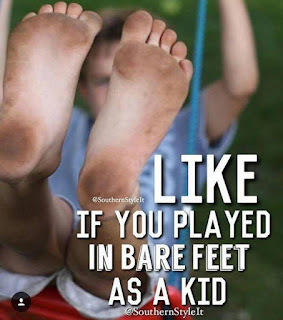 I'm not a parent myself, but I watch nieces, nephews and students bounced from music lessons to soccer to kids' club to church group... when do they get time to kick off their shoes and run in the dirt at the park?! I do think that time to just play can be as valuable. So... what's the solution?? In my classroom, I have found a way to satisfy the families who actually WANT homework while not spending hours and hours of time in preparation for those families who don't care about it at all. Once a month, I send home a Homework Bingo card. I challenge my students to fill a line or two (or the entire card!) yet I require nothing be returned to school. I am happy to celebrate with my students who DO accomplish this, and there's no pressure on the families who, for whatever reason, do not participate. For me, it is a Win-Win! 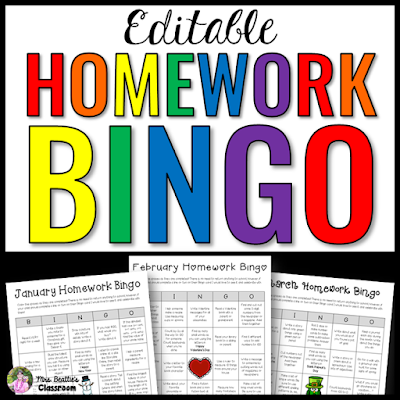 If you'd like to learn more about my completely editable Homework Bingo package, you can click the image below! And if you've enjoyed the ideas in this post, I hope that you will share it with your friends or social media followers! I come down solidly on the anti-homework side. Unfortunately, my school says homework has to be sent home and it has to be the same across the grade level, so I have very little control over it. I would rather my kids spend time reading, playing, exploring, building, and spending time with their families! I am a firm believer in NO homework aside from nightly reading. Our students are so scheduled now that there is less time to do homework, let alone to just go out and play. I would rather my students spend 10 minutes reading to a family member than to sit at a table and do a worksheet. Just my two cents! It is up to the individual teacher. Each year is different. Some classes want the homework and most of the students do it where as others dont bother doing it. It is time consuming and invaluable really! I am not a teacher, although I did study secondary education/ mathematics and have worked in the classroom or home-schooled for most of the past 20 years. I also have over 200 college credits and was an advanced student in high school. However, I do believe this gives me a different view on homework than the average student/ family. What I see is that it was the assignments, and sometimes the time in class the next day to discuss them, that helped me understand the subject the subject at hand. I spent many hours tearing down and building back up methods, theorems, and proofs so I could use and understand formulas or certain applications. I have taught two dyslexic children, my own, one with Aspergers, four with ADHD, and several in the classroom that had no support at home. I do see how too much time spent doing homework almost backfires and becomes more of a problem than a help. 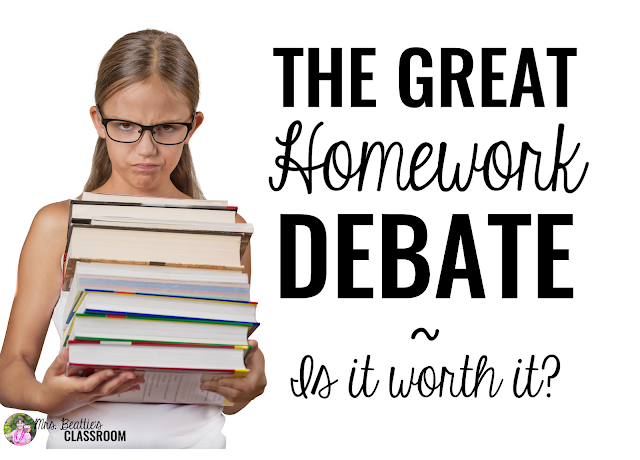 You make many good points about homework, and I definitely think not grading it in elementary is a great idea. Thank you for your thoughts, it is refreshing to read something so honest. Thanks for stopping by! I definitely think that homework beyond elementary school is a necessity. However, when we're talking about 7 and 8 year old children, we have to think a little differently about it. I work my students really hard throughout the school day, and I believe the need time to just be kids outside of school. Play is so important to their development and if I fill their play time with meaningless worksheets I'm not helping!